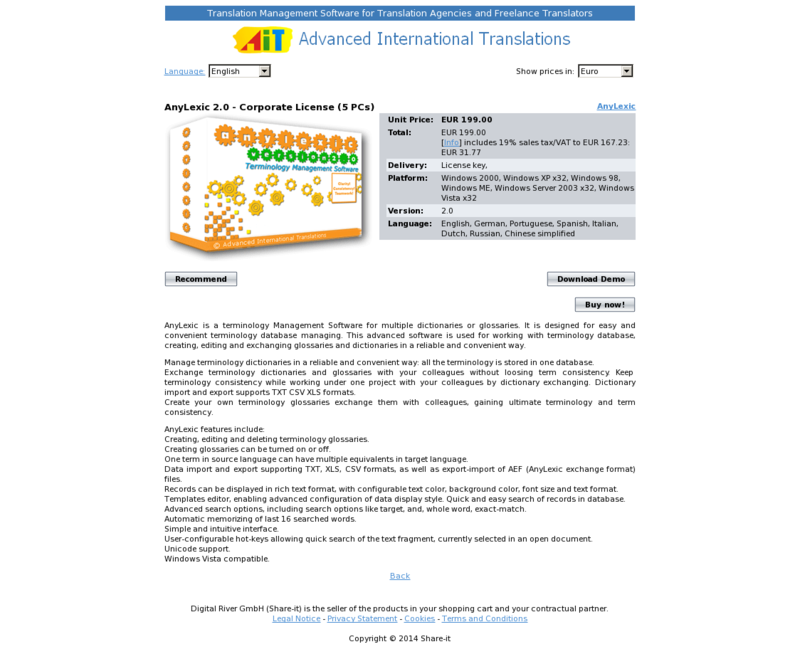 AnyLexic is a terminology Management Software for multiple dictionaries or glossaries. It is designed for easy and convenient terminology database managing. This advanced software is used for working with terminology database, creating, editing and exchanging glossaries and dictionaries in a reliable and convenient way. Manage terminology dictionaries in a reliable and convenient way: all the terminology is stored in one database. Exchange terminology dictionaries and glossaries with your colleagues without loosing term consistency. Keep terminology consistency while working under one project with your colleagues by dictionary exchanging. Dictionary import and export supports TXT CSV XLS formats. Create your own terminology glossaries exchange them with colleagues, gaining ultimate terminology and term consistency. Creating, editing and deleting terminology glossaries. Creating glossaries can be turned on or off. One term in source language can have multiple equivalents in target language. Data import and export supporting TXT, XLS, CSV formats, as well as export-import of AEF (AnyLexic exchange format) files. Records can be displayed in rich text format, with configurable text color, background color, font size and text format. Templates editor, enabling advanced configuration of data display style. Quick and easy search of records in database. Advanced search options, including search options like target, and, whole word, exact-match. Automatic memorizing of last 16 searched words. User-configurable hot-keys allowing quick search of the text fragment, currently selected in an open document.